The New Mexico State Library partners with the New Mexico Highlands University Department of Media Arts & Technology and the State Library's parent agency, the Department of Cultural Affairs, to create the New Mexico Makerstate, an initiative to bring makerspace programs and activities to New Mexico public and tribal libraries. These community workshops welcome children and families to try their hands at DIY projects from robot construction to 3D printing. The goal of the Makerstate Initiative is to excite New Mexicans of all ages about STEAM (science, technology, engineering, art, and math), and to do so in library environments, where idea sharing thrives. New Mexico has a rich heritage of making, founded in arts and artisanal crafts. Makerstate programs in public libraries introduce new concepts in digital media, enriching the existing culture of making. The success of the Makerstate Initiative lies in the efforts of Highlands University media arts students who deliver the programs to the libraries: AmeriCorps Cultural Technology interns Allie Burnquist, Mario Griego, and Miles Tokunow, John Aragon and Mariano Ulibarri. As a graduate project, Ulibarri founded Parachute Factory, a community-based makerspace in Las Vegas, NM, which has provided the base of operation for the Makerstate Initiative. The group has toured 42 communities statewide, directly serving over 3,000 New Mexicans. 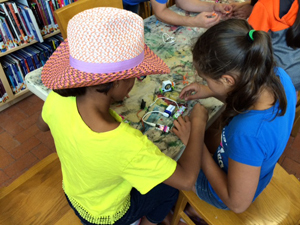 Events incorporate digital exploration of programming utilizing Scratch, a free programming language developed by MIT; invention kits such as Makey Makeys and Little Bits; Arduino microcontrollers; and Raspberry Pi's, credit card-size computers. Other events focus on the use of copper tape and LEDs to create paper circuits; sewable electronics, such as the LilyPad, a microcontroller board designed for wearables and e-textiles; and a variety of diodes. The most requested programs incorporate 3D printing, and the Makerstate team implements a variety of 3D printers, including products from Cube, MakerBot, and Taz, among others, and this year the group is experimenting with the Printrbot Simple. The group sources items to print by scanning both objects and event participants, as well as using free online resources, such as Thingiverse and Tinkercad. The New Mexico Makerstate Initiative has recently garnered national recognition, including a feature on the Institute of Museum and Library Services' website as a Project Profile, and has been presented at the New Mexico Library Association conference, the American Library Association's national conference in San Francisco, and the Allied Media Conference in Detroit. Not only does the initiative promote STEAM, it more specifically encourages digital literacy for all ages. These hands-on programs expose families to new technologies, as well as build a fundamental understanding of how electronics work. The intergenerational nature of the programs brings in children and their parents from all walks of life, truly making the Makerstate a project for all New Mexicans. Now in its third year, the program will continue with direct programming to the patrons and will expand with the addition of grant opportunities for local public and tribal libraries that wish to organize their own maker programs. National and university libraries in Europe, the USA, and Australia have greatly enhanced the presence of libraries on the Web by providing access to metadata, thereby greatly contributing to the promotion of open government and open data movements in their communities. To facilitate effective data use by computer systems and applications, the National Diet Library (NDL)  the sole depository library in Japan, which acquires all materials published in Japan for preservation as part of our national cultural heritage  has provided since 2010 a great variety of bibliographic data, including its metadata, as Linked Open Data (LOD). The NDL began a vigorous promotion of LOD in 2014, and has published a new English version of the introduction to NDL LOD on its website. There are three kinds of data available via API or as downloadable files. NDL Search is an integrated information search service that provides a gateway to the rich repository of knowledge contained in the NDL, public and academic libraries, archives, museums, and research institutions in Japan. Data sources for NDL Search include: NDL-OPAC, Japanese Periodicals Index, National Diet Library Digital Collections, digital archives provided by public and academic libraries in Japan, and others. To search and retrieve metadata in RDF-XML format, NDL Search provides the following APIs: SRU, SRW, OpenSearch and OAI-PMH. Please refer to the specifications for each of these individual APIs for further details. Web NDL Authorities is a service that provides NDL authority data as LOD, including subject and author headings created and maintained by the NDL. Web NDL Authorities also exchanges links with the Virtual International Authority File (VIAF). The NDL uses SKOS-XL, SKOS, DC-NDL, RDFS, Dublin Core, FOAF and OWL as terms for authority data descriptions. All the authority data are available on Web NDL Authorities via SPARQL, while the National Diet Library Subject Headings (NDLSH) in Web NDL Authorities are also available as a downloadable file in either RDF/XML or TSV format. The NDL Great East Japan Earthquake Archive, nicknamed HINAGIKU, is a portal site that enables integrated searches of multiple resources on earthquakes and subsequent disasters. Data sources for HINAGIKU include a variety of institutional repositories where records of the Great East Japan Earthquake, also known as the 2011 Tohoku earthquake or the 3/11 earthquake, are compiled. HINAGIKU provides metadata for a variety of materials  including photos, old web pages, books, journals, newspapers, and brochures  in RDF-XML format through three APIs: SRU, OpenSearch, and OAI-PMH. Please see our LOD pages: What is NDL Linked Open Data (LOD)? for general information about NDL LOD, How to use NDL LOD for the use of specific data, and How to link to NDL LOD for usage examples. Please feel free to visit our website and use our data! 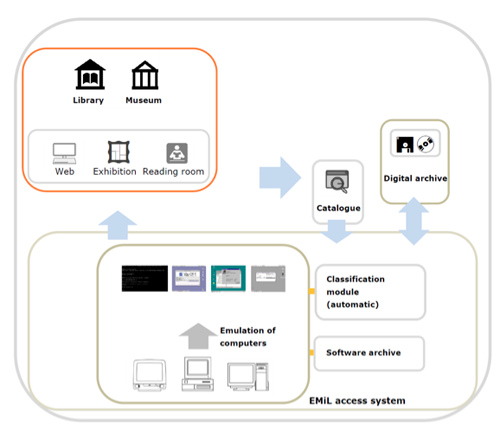 The German research project EMiL (Emulation of Multimedia objects in Libraries) aims at an emulation-based access framework for multimedia objects in libraries and museums. The project consortium consists of the German National Library, the Bavarian State Library, Karlsruhe University of Art and Design, and the University of Freiburg. The project is funded by the German Research Foundation (DFG) until 2016. The focus of the project is on providing access to multimedia objects of the 90s that usually are stored on CD-ROMs. Examples range from digital encyclopedias and computer-based training programs to interactive art. Such objects are difficult to present using current access systems in a reading room or exhibition space, since their original, now out-dated run time environments typically are not supported by the existing access system. Migration is not really an option in this context, because multimedia objects often consist of many files in different media formats, including executables. This calls for an emulation of the vintage run time systems in order to provide access. An access framework like EMiL faces a number of technical challenges. For example, vintage multimedia objects require a variety of run time environments, including different versions of Windows and Mac systems, and even old home computer systems. Because of the variety of objects and environments, the EMiL framework needs to be highly configurable and must be able to employ a range of different emulators, existing and future ones. The emulators currently used in the EMiL framework are all available as open-source software. Another major technical challenge for EMiL is posed by the huge size of digital collections, especially in libraries. It is impossible in practice to develop individual emulation solutions for thousands of objects. Therefore, automated procedures are needed. The EMiL framework automatically identifies an emulation environment that supports a chosen object, deploys the emulation, runs the object in the emulated environment, and shuts down the emulation after usage of the object. Access to the emulated multimedia object is provided to the onsite user through a web browser. In addition, the EMiL framework must fit into the existing access workflows of the institutions. It is yet another technical challenge to develop flexible system interfaces and procedures that allow us to integrate EMiL with a variety of existing and future systems, such as catalogue systems and long-term preservation systems. Information about the required run time environment for an object normally is not stored as part of its catalogue metadata, at least not in a sufficiently detailed and consistent form. As a key ingredient to an automated access workflow, a tool is currently being developed that classifies a multimedia object based on the contents of its raw CD image. This tool applies the FITS tool to generate a list of all the file formats contained in the image. Then, the tool computes a list of operating systems and application programs that are likely to support the object. This classification step uses a heuristic that analyzes the executables and specific file types that were found in the previous step. The heuristic also takes into account the date of publication of the multimedia object. The classification result can be used to automatically select a suitable emulation environment in the moment of access to the object, or as a recommendation during ingest of an object. The EMiL project builds upon previous research efforts. Most notably, it uses the bwFLA emulation framework as a core component that provides Web services for accessing pre-configured emulations. This set of Web services is being enriched and additional tools are being developed to support the access and ingest workflows in the partner institutions. The project also takes advantage of the insights about emulation as a preservation strategy that were gained by projects such as PLANETS and KEEP. An EMiL prototype will be presented by the end of the project that can be integrated into the access workflows of other cultural heritage institutions as well. Since the PREFORMA project awarded prototype phase funding to the veraPDF consortium in April 2015, the focus has been on initial targets; producing a prototype validator for PDF/A-1b files while establishing software delivery practices. Led by the Open Preservation Foundation and the PDF Association, the veraPDF consortium is developing the definitive open source, file-format validator for all parts and conformance levels of ISO 19005 (PDF/A). The software is designed to meet the needs of memory institutions responsible for preserving digital content for the long term. The prototyping phase runs until the end of December 2016. The veraPDF website was launched on 15 July along with the first public proof-of-concept software release; a minimal prototype capable of running individual validation rules. Since that initial release an archive of development downloads has been made available. the prototype PDF/A validation library, written in Java. An initial release of the validation library will be available in mid-September. The release will deliver prototype PDF feature reporting (characterisation) and an initial, unverified PDF/A-1b validation profile. By unverified we mean that the profile has been tested internally against our corpora, but has not yet been fully assessed by the PDF Association's PDF Validation Technical Working Group (TWG), nor has it yet passed the PREFORMA project's acceptance tests. This release will be available for download as a zip package containing a GUI and command line interface. A third release, to be published on 31 October 2015, will feature a cross-platform desktop installer and the prototype policy-checking implementation that allows users to define custom checks beyond the scope of PDF/A validation. The PREFORMA redesign phase will begin on 1 November 2015. During this period the veraPDF consortium will be conducting internal and external reviews of our design and codebase and reviewing feedback from early adopters. The early part of the redesign phase is a good opportunity for interested users to voice their opinions. Further details will be made available on the verapdf.org website. The veraPDF consortium will be issuing regular software releases during 2016, in advance of the version1.0 release candidate in December, 2016. For a detailed overview of the consortium's plans please visit the roadmap on verapdf.org. You can also receive updates by subscribing to the veraPDF consortium's newsletter. The veraPDF consortium is funded by the PREFORMA project. PREFORMA ( PREservation FORMAts for culture information/e-archives) is a Pre-Commercial Procurement (PCP) project co-funded by the European Commission under its FP7-ICT Programme. September 1, 2015  "A new investment of the Institute of Museum and Library Services (IMLS) will help libraries provide more e-books and make them more accessible to the public. With the IMLS award of $1,372,154, The New York Public Library, in close collaboration with the Digital Public Library of America (DPLA) and 19 partner libraries and library consortia from across the country, will further a project called Library E-content Access Project (LEAP). LEAP will expand and provide outreach for the Library Simplified e-content reader app and unify and improve the e-book borrowing and reading experience for library patrons across the country." "The project expands work begun in 2013 with an earlier IMLS grant for the development of the Library Simplified reader and resources. It also supports the Open eBooks initiative, an effort to make popular e-books from major publishers available at no cost to children from low-income families...."
"...Funding for this project is part of the $5 million IMLS investment in support of the Open eBooks initiative, which supports the development of the e-reader app, as well as tools and services to help the public more easily access e-books and other digital content. The project directly supports technology development and implementation of Open eBooks." August 31, 2015  "The Institute of Museum and Library Services announces the Notices of Funding Opportunity (NOFOs) for the first round of FY 2016 National Leadership Grants for Libraries (NLG) and Laura Bush 21st Century Librarian Program (LB21). The NLG program will invest in projects that address challenges faced by the library and archive fields and generate results such as new tools, research findings, or models that can be widely used. The LB21 program will support human capital capacity projects for libraries and archives. Preliminary two-page proposals that address IMLS priorities will be accepted until the October 1, 2015 deadline." 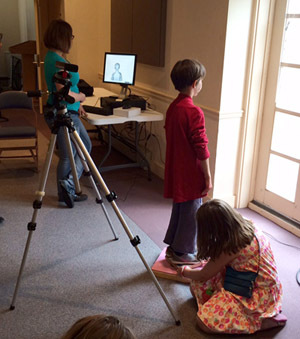 "The 2016 NLG and LB21 programs will respond to priorities around the National Digital Platform and Learning in Libraries, the topics of two IMLS Focus convenings in 2015. Materials from the nationally webcasted meetings are available to help inform the development of projects. Each program's NOFO provides more information about the types of activities that can be funded under these project categories." "Based on the success of a two-phase process piloted in the NLG program in 2015, IMLS has made similar changes to the LB21 program for 2016. IMLS will offer two opportunities to apply to each program in the fall and spring, and this set of NOFOs announces the October 1, 2015 deadline with a call for two-page preliminary proposals. From these proposals, IMLS will select applicants and invite them to submit full proposals by January 2016. Applicants who are not invited to continue from the first round of funding will be welcomed to submit new preliminary proposals in February." August 31, 2015  "The Institute of Museum and Library Services (IMLS) today announced 276 grants to institutions totaling $14,165,292. The grants were awarded through six programs: National Leadership Grants for Libraries, Sparks! Ignition Grants for Libraries, Native American Library Services Basic, Native American Library Services Enhancement, Native Hawaiian Library Services, and Laura Bush 21st Century Library Program." "See a list of awardees and project descriptions for Native American Library Services Basic and Enhancement and the Native Hawaiian Library Services program grants." "See a list of awardees and project descriptions for the remainder of the funded projects." "'The Institute of Museum and Library Services is proud to support the exciting work of the library grantees announced today,' said IMLS Acting Director Maura Marx. 'These projects underscore the important role libraries play across the country in engaging all ages of learners and in providing access to content, in physical and digital form. We look forward to watching these projects evolve and develop new models, tools, and research that can be broadly adapted by the library profession.'" August 31, 2015  "The National Information Standards Organization (NISO) has launched a new Primer Series on information management technology issues with the publication of the first primer on the topic of Research Data Management. Two more primers on the topics of Understanding Metadata and Linked Data for Cultural Institutions, respectively, will be released in coming months, with additional Primers to be published periodically." "'Meant to provide insight and instruction to researchers collecting data, these primers discuss the latest developments in research data and the new tools, best practices, and resources now available,' says Todd Carpenter, NISO Executive Director. 'Providing basic information to the wider community about NISO's activities is a critical component of our work as an organization. We seek to serve not only those who are deeply versed with technology in our community, but those who are starting out as well.'" August 28, 2015 blog posting  "As game players are growing beanstalks and leading the Eugene Mellonballers to victory, historic books are being saved from digital oblivion. In June of 2015, the Biodiversity Heritage Library (BHL) and Tiltfactor released two games called Smorball and Beanstalk to help crowdsource the task of text correction." "When a book is first digitized, its pages are merely image files and the text cannot be searched. Optical character recognition software (OCR) converts these page images into machine encoded text that can be searched, but historic literature has many idiosyncrasies that inhibit accurate OCR. BHL wanted to harness the power of crowdsourcing and the fun of gaming to allow humans to help correct inaccurate OCR. The games present extracted words from BHL books that users type out, thus verifying the spelling. These submissions are used to correct the OCR in BHL. By presenting users with a high volume of words in rapid succession during each play-through, we can receive a large number of word corrections and achieve a significant level of OCR correction...."
"...Smorball and Beanstalk were designed as part of the Purposeful Gaming and BHL project, which explores how digital games can make scanned content more accessible and searchable for cultural institutions. Based at the Missouri Botanical Garden in St. Louis, Missouri, 'Purposeful Gaming and BHL' was established in 2013 through an Institute of Museum and Library Services (IMLS) grant and includes partners at Harvard University, Cornell University, and The New York Botanical Garden." For more information, see the full blog posting. August 27, 2015  "Crossref, the not-for-profit organization that runs the metadata engine for scholarly content, is pleased to announce the addition of Jennifer Lin to its management team in the newly-created position of Director of Product Management. In this role Jennifer will be responsible for overseeing all stages of product development, maintaining the existing portfolio of services, and keeping her finger on the pulse of developments in scholarly communications." "Executive Director, Ed Pentz, says 'Jennifer has been involved in a number of scholarly publishing initiatives, such as the DOI Event Tracking project, impressing with her knowledge of the industry and her ability to drive projects forward. Her addition to the team will enable us to solidify Crossref's current offerings, develop new services through a well-defined product development process, and contribute to further improvements for the scholarly communications community.'..." "...Jennifer has fifteen years' experience in product development, project management, community outreach, and change management within the scholarly communications, education, and public sectors. She joins Crossref after four years at the Public Library of Science (PLOS) where she oversaw product strategy and development for their data program, article-level metrics initiative, and open assessment activities." August 18, 2015  "OCLC, along with the International Federation of Library Associations and Institutions (IFLA), has named five librarians selected to participate in the Jay Jordan IFLA/OCLC Early Career Development Fellowship Program for 2016. The program supports library and information science professionals from countries with developing economies...."
"...The Fellowship Program provides advanced continuing education and exposure to a broad range of issues in information technologies, library operations and global cooperative librarianship. With the selection of the five Fellows for the class of 2016, the program will have welcomed 80 librarians and information science professionals from 38 countries." August 14, 2015  "The American Library Association (ALA), in partnership with The Harwood Institute for Public Innovation, has released three new tools to help libraries engage their communities, focus efforts where they are needed most and lead positive community change." "The tools are the final pieces of a set of community engagement resources created for libraries as part of ALA's Libraries Transforming Communities initiative. Taken together, the collection  which includes worksheets, conversation guides and webinars  teaches libraries to 'turn outward,' making their communities the reference point for the libraries' work." "The new tools are designed for libraries that already have been putting the 'turning outward' approach to use, or those that have attended a Harwood Institute training or orientation...."
"...The full collection of 'turning outward' resources  including a 90-day 'Step-by-Step Guide to "Turning Outward" to Your Community'  can be downloaded, free of charge, at ala.org/LTC." July 31, 2015  "Lynn Silipigni Connaway, OCLC Senior Research Scientist, has been elected President-elect of the Association for Information Science and Technology (ASIS&T) for the 2016 administrative year, and President for 2017." "Connaway has been a member of ASIS&T for 25 years. She has served in a variety of leadership positions within the organization, including co-chair of the ASIS&T 2011 annual meeting and a Director on the Board from 2012-2015...."
"...ASIS&T President Sandy Hirsh, San Jose State University, noted that Connaway's election 'promises strong continuity of ASIS&T's important strategic planning efforts, with thoughtful innovation and continued outreach.' Becoming President-elect at the conclusion of the 2015 Annual Meeting in St. Louis, Missouri, Connaway will support 2016 President Nadia Caidi, University of Toronto, with planning and developing programs and structure. Connaway will have completed a three year term on the Board as Director at Large in November before becoming President-elect." July 29, 2015  "Today, public access to federally-funded research took one momentous move forward with the U.S. Senate Committee on Homeland Security and Governmental Affairs' vote to support the Fair Access to Science and Technology Research Act of 2015 (FASTR). The legislation would accelerate scientific discovery and fuel innovation by making articles reporting on publicly-funded scientific research freely accessible online for anyone to read and build upon." "FASTR would require federal departments and agencies with an annual extramural research budget of $100 million to develop a policy to ensure that researchers submit an electronic copy of the final manuscript accepted for publication in a peer-reviewed journal. Additionally, the bill would also require that each taxpayer-funded manuscript be made available to the public online and without cost, no later than twelve months after the article has been published in a peer-reviewed journal." "The library community, which has long advocated for public access to federally-funded research, cheered the Senate Committee's support of the bill. As critical public access points, libraries provide every sector of their communities with a wealth of research information." July 22, 2015  "Each year, the Institute of Museum and Library Services presents select museums and libraries with the nation's highest honor, the National Medal for Museum and Library Service. IMLS is now accepting nominations for the 2016 award which recognizes libraries and museums that make significant and exceptional contributions in service to their communities. Nomination forms are due October 1, 2015." "All types of nonprofit libraries and library organizations, including academic, school, and special libraries, archives, library associations, and library consortia, are eligible to receive this honor. Public or private nonprofit museums of any discipline (including general, art, history, science and technology, children's, and natural history and anthropology), as well as historic houses and sites, arboretums, nature centers, aquariums, zoos, botanical gardens, and planetariums are eligible...."
"...Anyone may nominate a museum or library for this honor, and institutions may self-nominate." July 22, 2015  "The new OCLC Community Center offers a place for library staff to connect online, share best practices, stay up to date on new product releases and contribute ideas to improve OCLC services...."
"...The new online Community Center enables library staff to find information they need in one place, including news, product updates and upcoming events. Members can connect and collaborate, addressing challenges, sharing best practices and learning from each other. They also can provide suggestions and feedback to OCLC product teams to help improve and enhance products and services."